Louez ce superbe bateau en partant de Monaco jusqu’à Cannes et découvrez la magnifique Côte d’Azur ! Monaco, Cap d’ail, Eze sur mer, Beaulieu sur mer, Saint jean cap Ferrat, Villefranche/mer. Ce modèle offre tout l’espace et le confort pour une vie à bord de première qualité. Pièce d identité (Passeport, permis)- Caution (chèque, CB) –Permis côtier (original). Pour conduire ce bateau sans skipper, il faut être titulaire du permis quelque soit le pays dans lequel il a été délivré et avoir au minimum 16 ans. Caution de 1500Euros si location sans skipper. 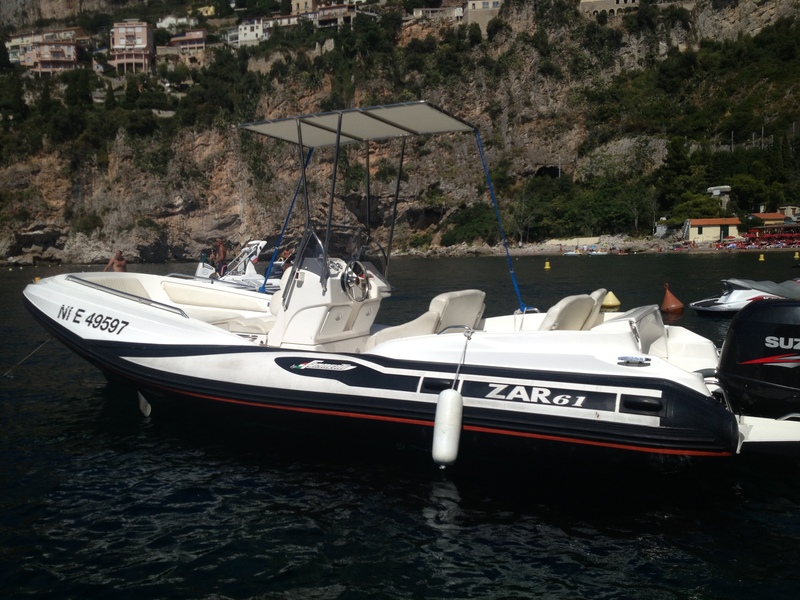 Rent the motorboat ZAR 61 and discover the coast of the French Riviera in boating style! The prices include TAX/VAT. Gasoline not included. Insurance included except propellers and cushions. 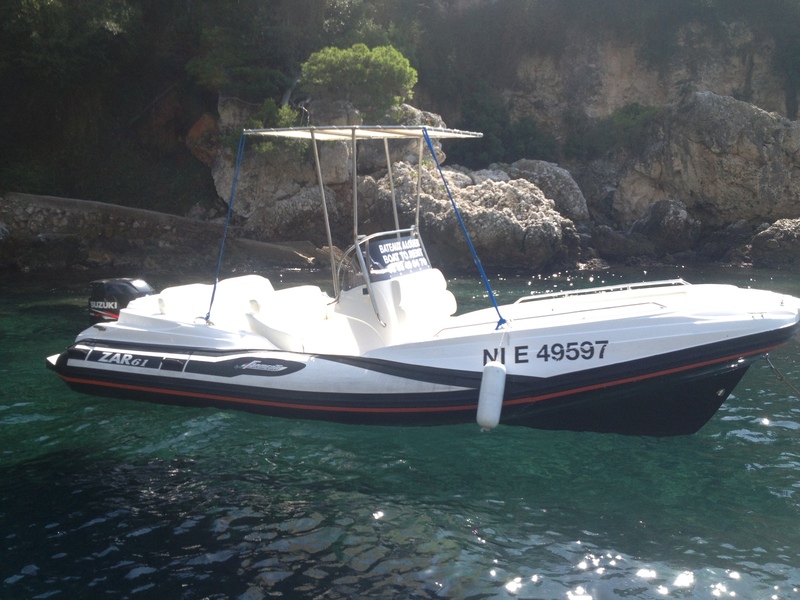 Easy on tow and for garaging, the ZAR 61 with a length of six meters offers to all its guests all the places and the comforts for a first quality life on board. There are ten peaks where You can stow unthinkable quantity of things, eight/nine forward running seats made with an anatomical profile, two huge sun beds bigger than in a two double bed, a two seaters console as comfortable and functional as in a Luxury Car,and a driver’s couch carefully studied for a perfect driving position (standing up or sitting down). 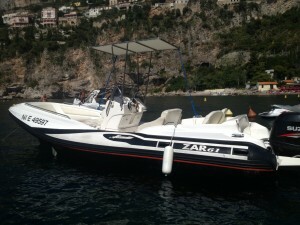 The ZAR 61 design is the most modern and practical one today available. And most of all is there a hull of a seven meters R.I.B. : long and deep for a very soft and dry impact on the waves, fast and safe also in the worst driving conditions, nimble and manageable in the port maneuvers. 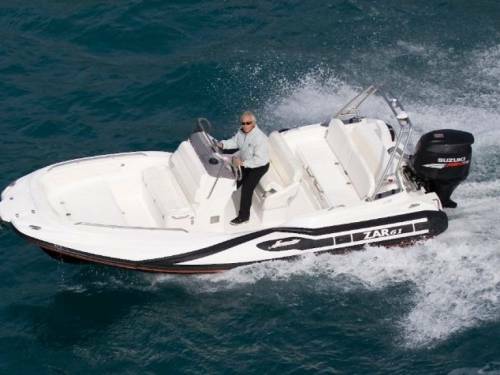 The ZAR 61 confirm and exalt the excellent marine performances of all the others ZAR models, without loosing safety and comfort, the most important ZAR project goals. 1 reticular polypropylene fuel tank (about 200 liters) according to standards CE; 4 handling handles; 4 stainless steel bollards; perimetric double millpond; polished stainless steel 6,5 Kg anchor;anchor-winch nose with stainless steel bow;3 stainless steel eyebolts for hangers. 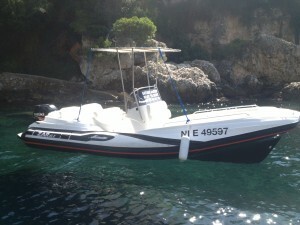 Deposit of 1500€ if rental without skipper. The deposit equivalent of insurance (maximum amount paid in case of damage on the boat).